FCFA is training African scientists in new skills and methodologies to study the African climate. N’Datchoh Evelyne Toure participated in a week-long workshop on climate modelling at the University of Leeds, organised by the Africa Monsoon Multidisciplinary Analysis 2050 (AMMA-2050) project in December 2016. West Africa spans the Sahel and experiences dust storms – which are sometimes gigantic in their scale and impact. As well as dust, the people of west Africa are also increasingly exposed to fine particles in the atmosphere from burning of biomass and from burning oil and diesel in transport and industry. The finest of these particles, known as PM2.5 (for particulate matter of equal and less than 2.5 µm) is particularly harmful to human health as the particles can become lodged in the lungs and interfere with circulation and breathing. This crossover between west Africa’s physical environment – especially its land-atmosphere dynamics – and human wellbeing is the focus for Dr Toure’s work. Trained first as a physicist, Dr Toure then completed her PhD in meteorology and climate science. Now she is a young researcher at Félix Houphouët Boigny University in her native country: Côte d’Ivoire. 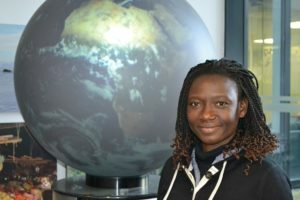 “I’m working on the impacts of aerosols on the climate over west Africa – studying the interaction,” she said in a recent interview in Leeds, UK, where she participated in a Future Climate for Africa training on programming climate models. “I can learn Python and share it directly with my institution. I am using Matlab [in Laboratoire d’Aérologie, France where I am a postdoctoral fellow] and it is quite expensive and the institution cannot buy it. So Python is a nice alternative. It is great opportunity for me to learn and use it for my research and share with my colleagues and students. It helps me to process my data and do some plots and maps,” Dr Toure said. Image: N’Datchoh Evelyne Toure, courtesy Mairi Dupar, FCFA.